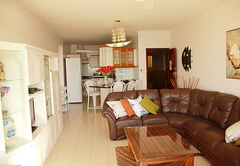 11 Les Palmiers is a property providing self catering in Ballito for up to 6 guests visiting the Dolphin Coast region. 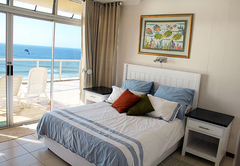 Les Palmiers in Ballito Bay on the Kwazulu Natal Dolphin Coast offers superb self catering holiday accommodation right on the beach. 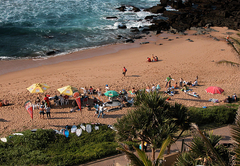 Without crossing any roads, you walk onto a beautiful secluded beach in the heart of Ballito. 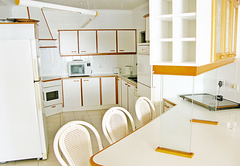 Les Palmiers is a small 15 unit complex; all flats have panoramic unobstructed sea views. 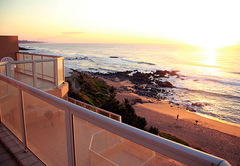 Situated directly adjacent to the beach front promenade (no crossing of roads), Les Palmiers is one of the most sought after apartments in Ballito. 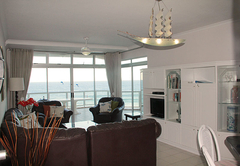 This modern furnished apartment has magnificent sea-views from all rooms including the three bedrooms which lead out onto a stunning large patio overlooking the beach. 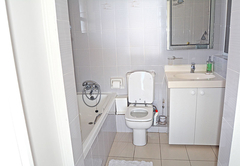 There is a secluded beach directly in front of the apartment and is only 500 meters from the main beach and within walking distance of all amenities. 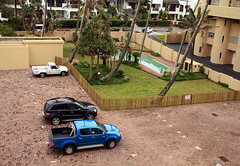 The complex has a protected swimming pool with barbeque area, there is parking for two vehicles, one in a private lock up garage and the other in the secure area. 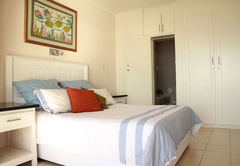 • The large main bedroom opens onto the patio with sea views and has a queen size bed with en suite bathroom consisting of bath, shower, vanity basin & toilet. 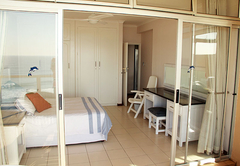 • The two second bedrooms also open onto the patio with sea views, furnished with two single beds each, sharing a bathroom with bath, shower, vanity basin & toilet. • Single lock up garage and one secure outside parking space. • Linen and bath towels supplied. Please bring your own swimming towels. 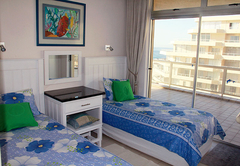 • Direct access to the beach no crossing of roads! • Fenced swimming pool with barbeque area. Enjoy a wonderful holiday and participate in all the exciting activities that are available right on your doorstep. Spend a lazy day on the beach or enjoy viewing the “Big Five” at Hluhluwe Game Park, just two hours drive from Ballito Bay. The area boasts a number of championship golf courses, ideal for the casual or competitive golfer.